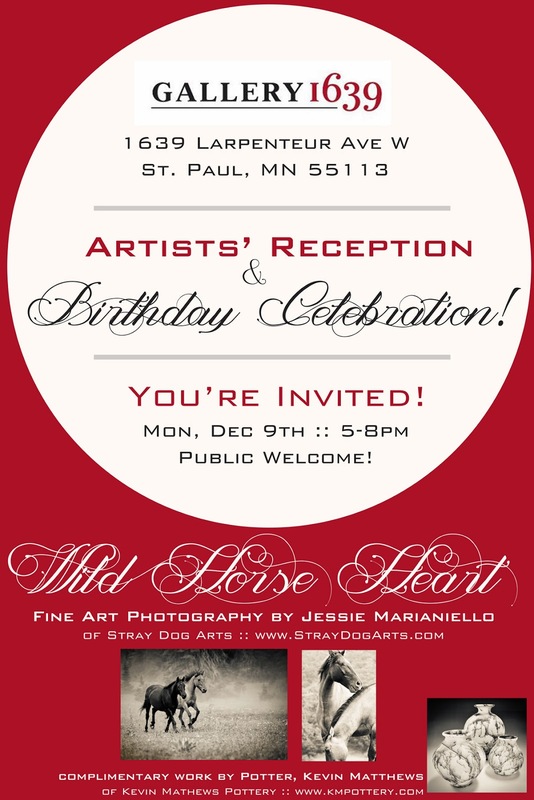 Stray Dog Arts: Wild Horses, Wine, and a BIRTHDAY PARTY!! :: You're Invited! Wild Horses, Wine, and a BIRTHDAY PARTY!! :: You're Invited! Wild horses, art and wine! Let's have a party! A birthday just wouldn't be a birthday without YOU to celebrate it with! 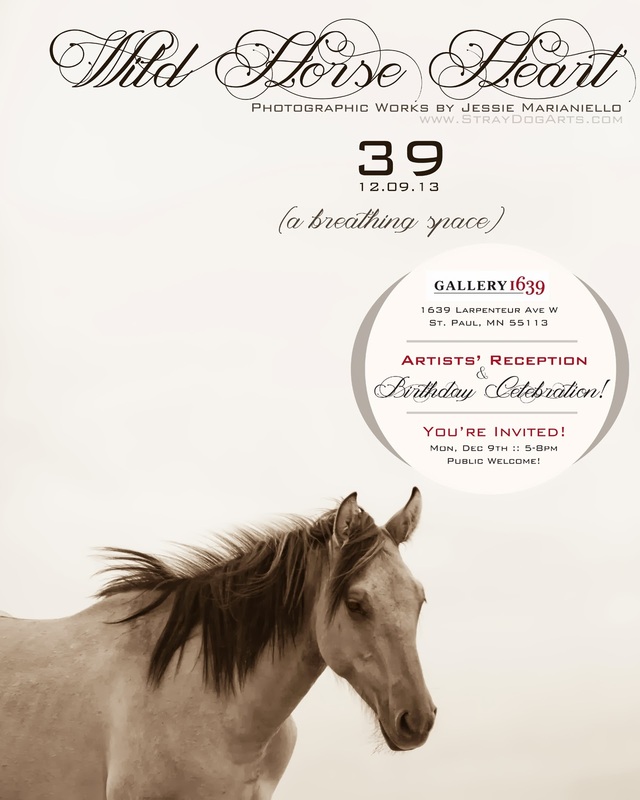 :) Please join us for an artists' reception at Gallery 1639! The past couple of years have taken me on some pretty awesome adventures, including my time spent with wild horses. Horses have pulled me deeper into the photographic processes of my art, but even more than that, they have become profound healers and teachers in my life. This past summer I traveled with a small posse of renegade women to the far reaches of the Wyoming mountains to spend time with these wild ones. To say it was an adventure would be an understatement. To experience the thundering and dust of a couple hundred wild horses stampeding through your camp, well now...that is something to be savored. We spent entire days, alone or together, with these horses. I felt my heart turn into something whole and strong. I observed their relationships and movements and, in the process, felt a little bit closer to myself, too. Wild Horse Heart is an ongoing project that began as a cross-country trek two years ago. I was in search of wild horses, but I was also in search of myself. This series of photographs (and paintings) continues to evolve and unfold in ways that my spirit refuses to over-plan. It's a breathing space. And I share this little piece of it with you as a gift--to both of us. This life is as gorgeous as we allow it to be. Be Brave. Be Wild. Be Free. On Monday, Dec 9th, I'll be turning 39. I think we're supposed to keep our age a secret at some point, but (ha!) I have to admit, I love birthdays. I love my birthday; I love your birthday; I love birthdays in general. Anyway, 39 feels like it's going to be a good year. It is a year of groundedness, compassion, artistry and integrity. And I also have a feeling that it's going to contain a lot of love--from endless sources. To me, breathing space contains a hearty and necessary dose of calm. It leaves room for a sense of purpose and connection. It invites adventure and travel. It makes space for learning and pursuing the projects I am most energized by. With breathing space, things have a way of falling into alignment. The impossible becomes possible; the uncomfortable becomes more comfortable. New ideas spark from the ethers; creative leaps of faith find a place to land. So tell me: What is it that YOU wish for in the year ahead? Wanna inspire each other? Monday, December 9th: Some might call it an art opening. I'm calling it a BIRTHDAY PARTY!!!!!! :) Let's raise a toast to friendship, intention, and living life with a beautifully wild heart!